Who could be crabby with a sandwich like this on their plate? 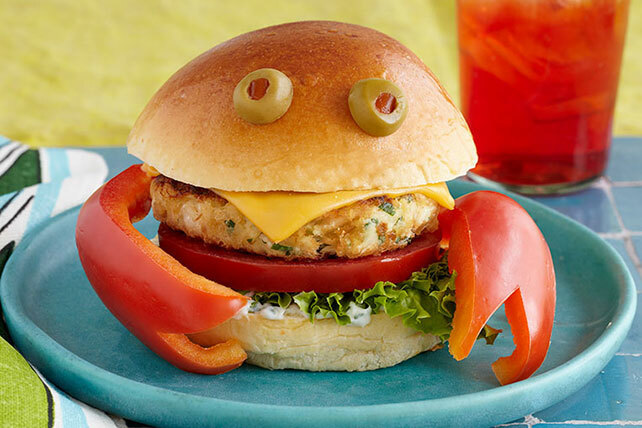 Bonus: As cute as they are, these crab burgers are also delish! Mix first 6 ingredients until well blended; shape into 6 patties. Heat oil in large skillet on medium heat. Add crab patties, in batches, if necessary; cook 3 to 5 min. on each side or until golden brown on both sides. Remove from skillet; drain on paper towels. Mix mayo and cilantro; spread onto buns. Fill with lettuce, tomatoes, crab burgers and Singles. Cut notch in wide end of each pepper strip. Place 2 on opposite sides of each sandwich to resemble the crab's claws. Add olives for the eyes. Serve with prepared KOOL-AID Tropical Punch Flavored Sugar-Sweetened Soft Drink Mix. To serve as an undecorated sandwich, omit red pepper and olive garnish.